Skoda has been putting up efforts to capture all kind of motor markets by introducing its one or another model. 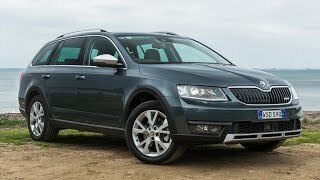 Here we are for the model year Skoda Octavia Scout 2015 4*4, an all new SUV version to Skoda wagon. Company has worked thoroughly over reducing fuel consumption and adding some advanced technological feature with better powertrain options beneath the hood. Let us have a descriptive look at the model. 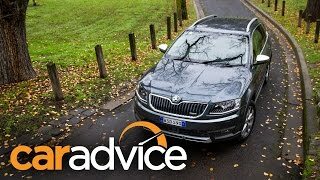 In context to interior of Skoda Octavia Scout 2015 not much has been shared by the company but the outline is, customers will get a highly spacious interior with upgraded safety features and a much cleaner interior with Skoda Octavia Scout 2015. As of now we can’t say much about the interior but yes as conveyed by company, customers will get safe riding with up to nine airbags fitted inside and also a new feature Crew Protection Assistant for the safety of your Skoda Octavia Scout 2015. Apart from this you can be sure of lot of space; we also expect rear seats to come with complete folding option so that the luggage compartment can be exceeded. Relying upon its new 4*4 design technology we feel there will be sufficient legroom and headspace inside. Few more features that come as an option are the Intelligent Light Assistant and Park Assist. Last but not the least you’ll also get a rear-view parking camera inside your all new Skoda Octavia Scout. 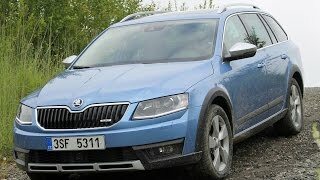 Exterior of Skoda Octavia Scout 2015 portrays a rugged off-road look. Model gets bit elongated and wide in its size and a taller ride height also. However inspite of getting bigger Skoda Octavia Scout commendably saves around 20% of fuel consumption. Front fascia of Skoda Octavia Scout 2015 gets a unique grille with Skoda emblem marking in its center-top. At both side of it is beast like headlights incorporated with indicators. Beneath on the front bumper are fog lamps at each side and in center is massive air vent to deliver fresh air to engine. Back of the rear view mirrors come in dual color with lower base being black while rest matching the body color. 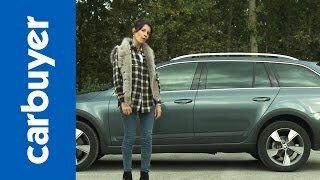 Moving towards the rear fascia of Skoda Octavia Scout 2015, you’ll notice slightly upright posture with trunk lid extended little more towards back. Massive taillights incorporate indicators and brake lights in them. In all the entire exterior of Skoda Octavia Scout 2015 is attractive and decently aggressive. Skoda Octavia Scout 2015 comes with three powertrain options; 2 diesel engines and 1 petrol engine. The diesel line-up includes 2.0 Liter TDI delivering total output of 148 hp and peak torque of 320 nm while the second 2.0 Liter TDI offers 181 hp and peak torque of 380 nm. Last the 2.0 Liter TSI delivers 177 hp and peak torque of 280 nm. The first 148 hp variant comes paired to a six-speed manual transmission while the other two are mated to six-speed dual clutch transmission.